Too much mold can affect the health of you and your family. In addition, mold can damage or destroy building materials such as wood or gypsum board in our homes. This article answers your questions about mold, what it is, where it grows, how it spreads, how it can be prevented. For more information, see Popular Topics/Homeowner Resources. Mold, one type of fungus, is different from plants, animals and bacteria. Molds are decomposers of dead organic material such as leaves, wood and plants. Molds sometimes can infect living plants and animals. The spores and hair-like bodies of individual mold colonies are too small for us to see without a microscope. When a lot of mold is growing on a surface, it often appears black or green. 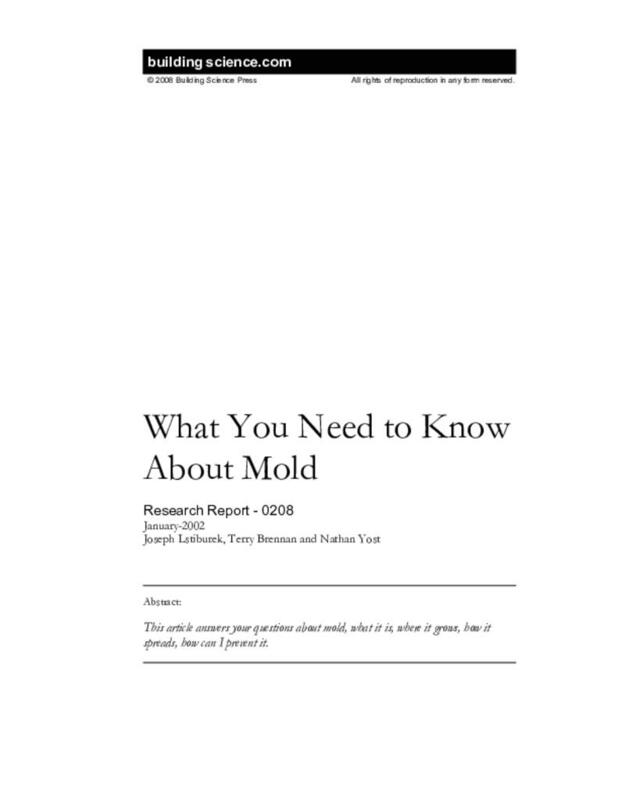 The color of mold is influenced by the nutrient source and the age of the colony. If mold is growing behind vinyl wallpaper, colorful pink or purple splotches may appear. Mold growing on fabric is called mildew. Mold needs water to grow; without water mold cannot grow. Mold also needs food, oxygen and a temperature between 40 degrees and 100 degrees F. Since mold decomposes dead organic (once living) material it can grow on wood, the paper facing on gypsum board (drywall) and other materials made from wood. Molds secrete digestive fluids that decompose the substrate, making nutrients available. Mold can also digest some synthetic materials such as adhesives, pastes and paints. While mold cannot get nutrients from inorganic material such as concrete, glass and metal, it can grow on the dirt present on these surfaces. Molds prefer damp or wet material. Some molds can get moisture from the air when the air is very damp, that is when the relative humidity is above 80%. The high humidity makes surfaces damp enough for mold to grow. Mold can grow by extension of hyphae that are like tiny root hairs. In this way, a small colony of mold can expand to cover many square feet of material. Mold can also make spores that are like very small seeds. Spores can survive conditions that are too sunny, hot, cold, dry or wet for mold to grow. When spores are released they can be carried by air or water to new locations. Some spores are so small that they are more affected by air currents than by gravity. When spores land on a damp surface that has food and oxygen available, and if the temperature suits them, they will start to grow. It is important to realize that mold spores are present everywhere, in outside air as well as indoor air – unless very special precautions are taken to remove or kill them. Wherever there is decaying organic material (leaves, mulch, wood) mold and mold spores are also present. Everyday we are exposed to airborne mold spores from outdoor sources, sometimes at high concentrations. It is almost impossible to create a mold free space or to keep a space mold free. What we can do – and should do – is control the amount of mold in our indoor environments. Too much mold can affect the health of you and your family. In addition, mold can damage or destroy building materials such as the wood or gypsum board in our homes. Most people are not affected by exposure to mold, unless they are exposed to a lot of mold. Unfortunately, we are not quite sure what “a lot of mold” means. Furthermore we don’t know if “a lot” of exposure to mold for “a brief time” is worse than “not so much” exposure for a longer time. We’re also not sure what “not so much” means. Each person is different; what amounts to a “lot of exposure” for some people is “not so much” for others. Remember, mold is everywhere; we are all exposed to mold every day. Exposure to mold can cause allergy in susceptible people, but we don’t know how much exposure is necessary to start the development of allergy. If you have asthma, exposure to mold can cause an asthma attack or make your chronic asthma get worse. At this point we do not know if exposure to mold, especially early in life, can lead to the development of asthma. Although exposure to “enough” mold can cause allergy to mold in susceptible people, accurately diagnosing the allergy can be difficult. Unfortunately, doctors can test for allergy to only a very few of the thousands of species (kinds) of molds that exist. Only a few molds seem to be able to sometimes cause an infection in healthy people; fortunately these molds do not usually grow in buildings. However, people with a suppressed immune system are much more susceptible to fungal (mold) infections and many of these fungi do grow in wet buildings. Individuals with AIDS, certain types of cancer and those with organ (heart, kidney) transplants on certain drugs are much more susceptible to fungal infections. Molds sometimes make powerful chemicals called mycotoxins. We think that molds make these mycotoxins to decrease the growth of other molds and bacteria. Penicillin is a mycotoxin that we use because it can kill certain bacteria. Unfortunately some of these mycotoxins make people sick. Mycotoxins can cause illness when they are inhaled, absorbed through skin or ingested (swallowed). Presently we do not know all that much about the health effects of most mycotoxins on humans. Most of what we know about mycotoxins comes from exposure of farm animals to moldy grain or hay. We do not have any tests that can determine whether mycotoxins are the cause of someone’s illness. We cannot easily or reliably measure the level of mycotoxins in air samples to determine exposure levels. The answer is simple: keep your home dry. If mold does not have moisture it cannot grow. Remember mold spores are everywhere so you cannot completely keep them out of your house. Since our houses are built with wood products and paper faced drywall, food for mold is always present. Mold can also thrive on dust, cockroach and dust mite feces, skin flakes and food particles. Oxygen is available in the air so we cannot prevent mold growth by eliminating oxygen. Therefore, controlling moisture is the only effective strategy for preventing mold growth in our homes. How Do I Keep My House Dry? First, prevent excessive moisture levels in the air in the house by using the exhaust fans in bathrooms and kitchens where moisture is often generated. Make sure the air from your clothes dryer exhausts from the house. Avoid using a humidifier. If you think that you need a humidifier, first measure the relative humidity inside your home. A device called a hygrometer can measure the relative humidity. Try to keep the relative humidity (RH) below 60%. There is rarely a reason to use a humidifier if the RH is above 25%. If you feel you must use a humidifier, measure the relative humidity in the area receiving the humidified air. Never let the humidifier raise the relative humidity above 35%. Second, look for areas of dampness or wet spots. Roofs, windows, basement walls and plumbing pipes sometimes leak. If a leak happens suddenly, dry the wet materials as quickly as possible. Mold spores begin to grow 24-48 hours after a water leak. Dry the house quickly and mold will not be a problem. Small recurring or continuous leaks that are hidden in walls, ceilings or floors present a different challenge sincemold growth could be extensive before it is detected. Be alert for dampness in areas such as under sinks, in bathrooms and in ceilings below bathrooms or other plumbing. If you notice dampness in one of these areas or if you notice a strong musty smell in one of these areas, contact your builder. What Should I Do If I Suspect I Have Mold in My House? First and foremost, do not panic. Remember mold is everywhere. Even if you do have more than “normal” amounts of mold in your house, you have not necessarily been exposed to it. Exposure means that the mold or mold spores or toxins have gotten inside your body by inhalation (breathing), ingestion (eating) or absorption through your skin. If mold is inside a wall in your home but it does not get into the air, you have not been exposed. The mold has to get from the wall cavity into the air in the house before you can be exposed to it. However, that does not mean that it’s good to ignore the mold if you know you have it somewhere in your house. The mold will continue to grow (as long as it has water), eventually damage the building and increase the chances that you will be exposed. How Do I Get Rid of Mold In My House? That depends on how much mold is present and where it is located. If there is only a small amount of mold, such as in a bathroom or kitchen, scrub the moldy area with soapy water, rinse thoroughly and allow to dry. If you have asthma or severe allergies or a weakened immune system, get someone else to do the clean-up. If you have mold on a wall, floor or ceiling, the first question is “where did the water come from?” Remember, mold has to have water to grow. There is no point trying to remove the mold if you do not also correct the moisture problem that led to the mold. If the moisture problem remains, mold will quickly grow back after the initial cleanup. If mold is present in just one corner of a closet scrub it with soapy water, rinse and thoroughly dry. Don’t store boxes right up against that corner. Do something to keep that corner warmer such as leaving a light on in the closet. If you have mold growing under a window that leaked or somewhere else that probably is due to a leak, you should have someone with experience dealing with mold in buildings evaluate the building. Why? Again, you need to fix the underlying moisture problem. And more importantly you can release a lot of mold from inside a wall cavity if you don’t do the work properly. You can turn a “little bit” of exposure into a “lot of” exposure very quickly.